A shortish tree with strikingly proliferous large flowers. 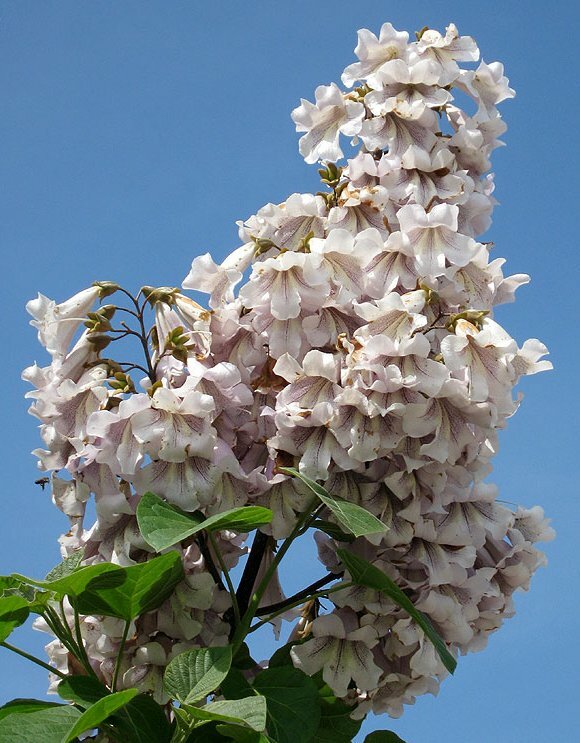 The lilac-coloured flowers are in upright panicles. The canopy is fairly open. 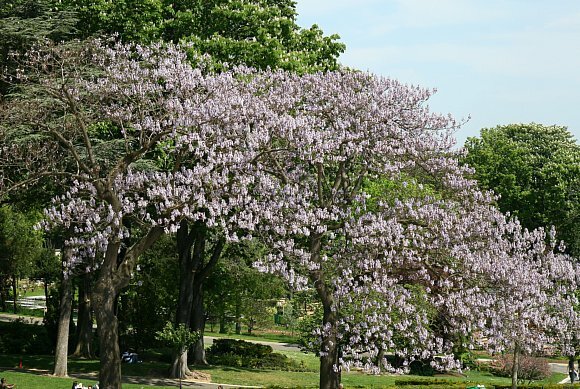 Flowers are held in upright panicles, rather similar to those of Horse-Chestnut Trees. The panicles stand upright up to a foot long; the flowers are large and on short stalks drooping downards. The leaves are huge, up to 35cm across, and broadly ovately heart-shaped with tapering tips. Often, but not shown here, they have forwardly-pointing side lobes. Brown in bud, the 6cm long flowers open up becoming lilac to mauve in colour and flared into a tuba shape, but with five lobes. 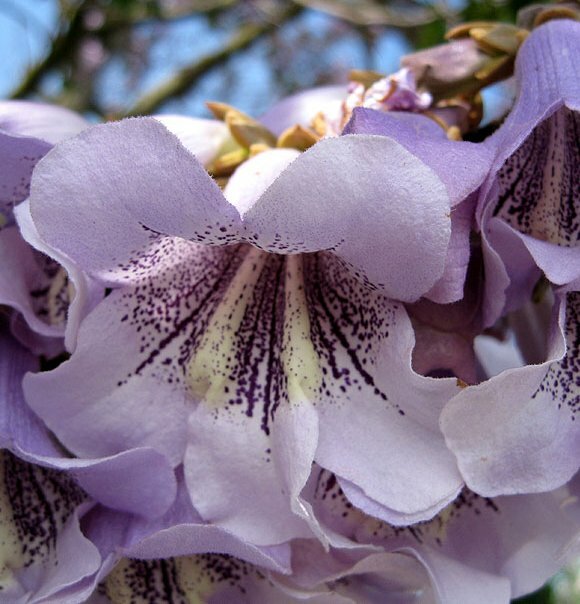 Flowers similar to those of Western Catalpa which are white with violet to indigo markings. The lower lobe is more of a lip and has cream-coloured sides. The inner has indigo-coloured speckled streaks fanning outwards. The lilac colour blends to whiter shades towards the opening. The bark is rough with deepish fissures. 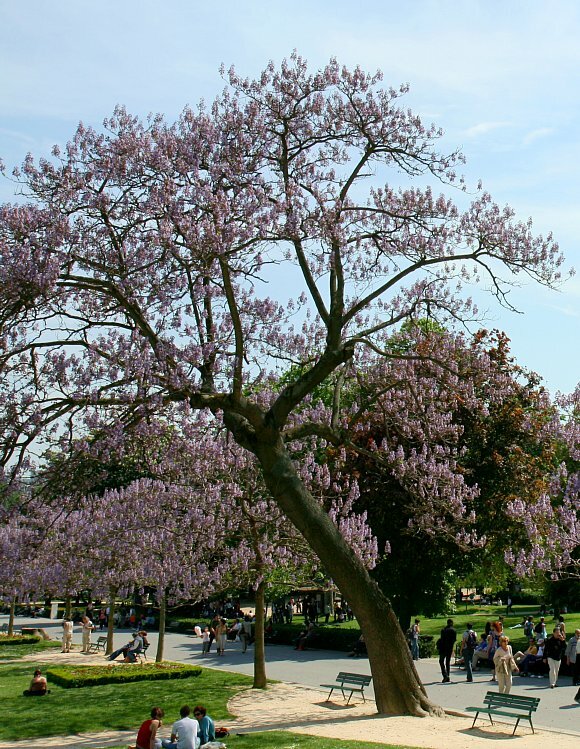 Paulownia Imperial is an alias of Paulownia Tomentosa. The leaves are large and can be much larger than this in the first year. Leaves similar in size and shape to those of Western Catalpa Tree and Indian Bean Tree . The leaves can grow to 30cm or even 60cm across and adorned with short matted hairs. After flowering large egg-shaped fruits develop. The new wood is light-coloured and very soft. The fruits are dry, 3 to 4cm across and egg-shaped, containing numerous tiny seeds, up to 20 million per tree. The seeds are winged and are dispersed both by wind and by floating in water. More developed but still unripe fruits. Showing the normally hidden sepals, which are thick and with short matted hairs (aka tomentose). The petiole twigs are similarly adorned. 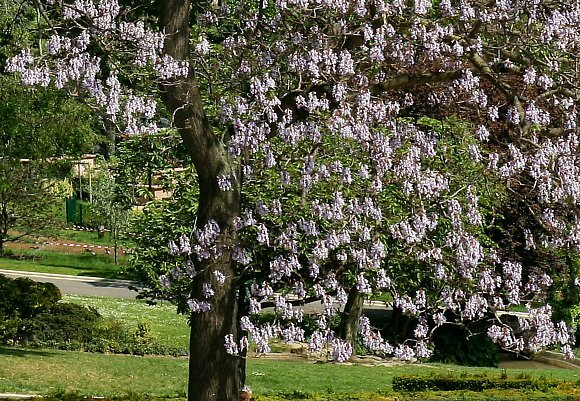 Distinguishing Feature : The masses of panicles of lilac coloured flowers in early spring. No relation to : Foxglove [a plant with similar name, although it used to be placed in the Figwort & Foxglove Family [Scrophulariaceae]]. The flowers themselves have some resemblance, in both shape and internal markings, to : Indian Bean Tree (aka Southern Catalpa ) (Catalpa bignonoides), Western Catalpa (Catalpa speciosa) and Yellow Catalpa (Catalpa ovata) which are all trees with similar, but not identically shaped, large leaves, and also (with their raised central tongue - the lower of the 5 petals) to the many Monkeyflowers such as Mimulus guttatus which are not trees and have yellow flowers. 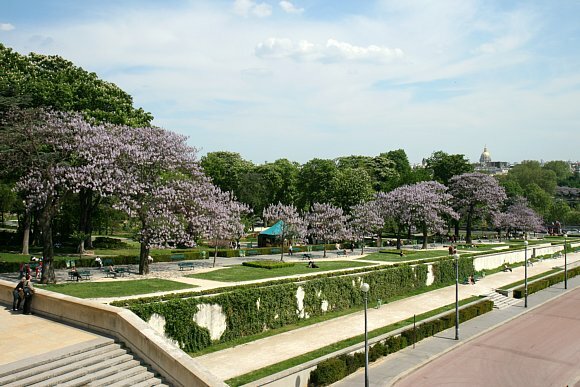 A deciduous tree, rather short in stature only up to 15m - 20m tall, with an open canopy. A proliferous flower in early Spring. When it is flowering, the leaves are not predominant. 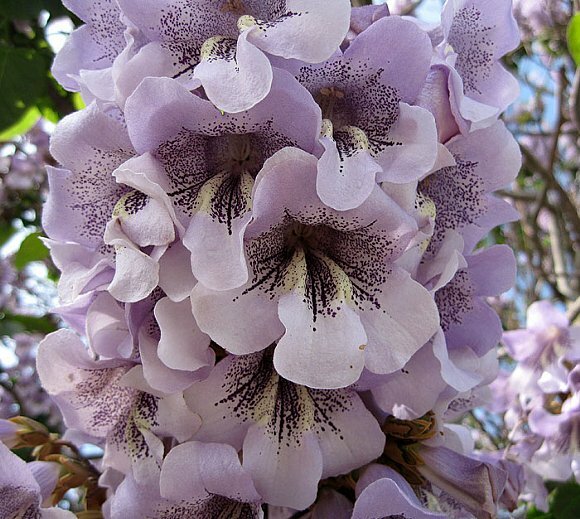 It is originally from China and is not native to the UK, but grows here, especially along the Thames in London. It is extremely fast-growing and can be invasive in other parts of the World since it produces a copious number of seeds which are winged and can travel by the wind. 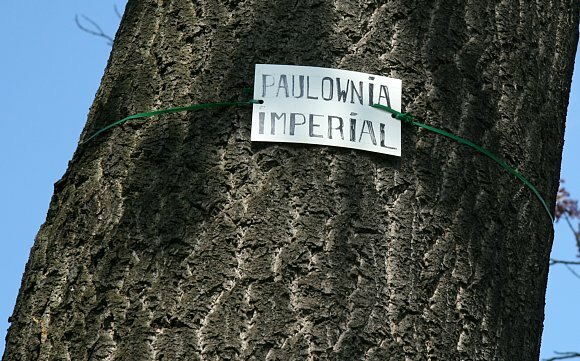 It is reputedly the fastest growing tree in the World, growing 40 feet in 5 years. Like Buddleja, it can take root almost anywhere, on the sides of buildings etc, and it's roots are very destructive of modern structures such as sewer pipes, septic tanks, etc. It can grow to 80 feet high and has a habit of breaking in ice-storms. That said, it will not grow everywhere, and is only highly invasive in certain parts of the World. 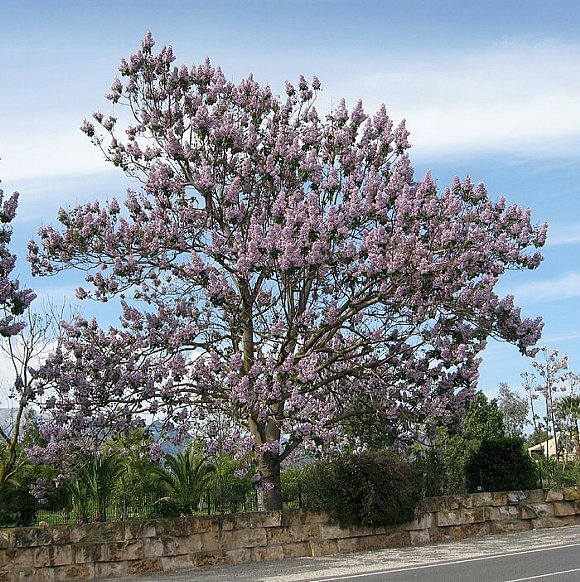 In certain parts of America the mountainsides are plastered in these purple-flowering trees. The tree will regenerate from root-stock earning it the name Phoenix Tree. The roots run deep and are able to penetrate hard compacted soils. It will tolerate polluted and contaminated industrial wastelands. Thus it has all the characteristics necessary to make it an invasive weed if it ends up in the right place. Seeds don't seem to take nor a seedling grow if there are nematode worms in the soil. The wood is lightweight (density 0.25 - 0.3) commensurate with a fast-growing tree, which can be harvested in as little as five years. In its native habitat the growth in its younger years is so rapid that tree growth rings are up to 8mm wide, but in the UK where temperature is lower and winters harder growth is slower. Indeed, if the temperature drops below 5C for too long no flowers will develop in spring. Flowers occur only on mature wood. It is a sun-loving tree and will not survive for long in the shade of other trees. The wood is used for veneers, drawers, sounding boards for musical instruments such as the Japanese koto and Korean gayageum zithers, wine barrels, beehives, aircraft fittings (because of its light weight), handicrafts (because the wood is easy to carve), patterns (the wood has high dimensional stability) and for making charcoal. The leaves have white, yellow and brown dendritic trichomes. Because of taxonomists recent insistence that Foxglove Tree be moved from the Figwort Family to a totally new Family populated entirely by itself, there could possibly be some chemical signatures associated with this plant that are reflected in perhaps unique compounds it may synthesize. It contains geranylflavonoids . The tomentosa part of the name refers to the tomentose (that is, covered in a dense and matted mass of woolly hairs) nature of the leaves.